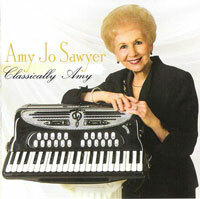 Amy Jo Sawyer has recently released her newest solo CD “Classically Amy” which indicates she still has what it takes to tackle some of the accordion solos so popular during the heyday of the accordion in the USA. Several of the solos are almost “standards” among those hundreds of solo accordionists who competed in the many accordion competitions held back in the 1950’s and 1960’s. This recording, however, is not a compilation of some performances from her earlier years; they are recently recorded. The CD would be quite interesting and very helpful to any accordionist learning to play these solos today. As she always has, the artist plays the nine-row Giulietti accordion and has included solos played on both free-bass chromatic system and on stradella. The program notes are fun to read and very informative for those being initially exposed to the repertoire. In addition to her own arrangements, Amy Jo includes one by Frank Marocco (the popular “Libertango” by Piazzolla), two by Charles Magnante (de Falla’s “Ritual Fire Dance” and “Sabre Dance” by Khachaturian), two by Anthony Galla-Rini, (Lecuona’s “Malaguena” and the Debussy “Clair de lune), the Domenico Scarlatti “Sonata in A minor, K. 149” arranged by Mogens Ellegaard, and even the Frank Gaviani solo arrangement of the very familiar Third Movement of the famous “Violin Concerto in E minor, Op. 64” by Felix Mendelssohn. Her own arrangements include the “Flight of the vBumble Bee” by Rimsky-Korsakov, “Little White Donkey” by Ibert, and Three Pieces from “The Children’s Album” Book 2, by Khachaturian. 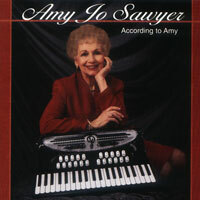 Amy Jo Sawyer has become very popular and well-known in recent years for her own compositions which are usually more of the entertainment or commercial styles of music, including tango, swing, and Latin jazz, for example. She has written not only for solo accordion but also for accordion ensemble. The entertaining compositions are not normally difficult but rather quite accessible by most all groups of accordionists today and very popular with both performers and listeners throughout the world. Reviewed by Joan Cochran Sommers, August, 2010. Notes from the composer for each piece and sample page/s can be viewed by clicking the links below. You can also purchase by clicking the links below.